In 1953, the GIA (Gemological Institute of America) the world’s foremost authority on diamonds, established a system for grading diamonds that later became the universal standard for determining their attributes. There are four basic parameters for evaluating and certifying diamonds: cut, carat, clarity and colour. These four factors are called the 4 C's. Every diamond has its own unique characteristics. The particular combination of each 4C grade as well as other details (diamond polish, fluorescence, symmetry) reflect a diamond’s value. Carat is a term that refers to the weight of a diamond (international abbreviation is ct). Before the 20th century, diamonds were measured using carob seeds, due to small and uniform body was the perfect counter weight for diamonds. The word "carat” has the origins in the word "carob". Dimonds of over 2 ct are rare, less frequent and therefore more valuable. This is the reason why a full 2 ct diamond is more expensive than two separate diamonds of 1 ct having the same quality. Two diamonds of the same appearance can differ in weight based on their cut. For instance, if a diamond has a too-deep (shallow) cut, it might look small for its weight and lack brilliance. Depending on its shape and weight we can approximate the diamonds diameter. A diamond's colour actually refers to its lack of colour. The most valuable diamonds have little to no detectable color. The less color, the higher their price. The predominant color you see in a diamond is yellow, which is caused by the trace element nitrogen. GIA's - D to Z diamond color grading system is the industry standard. The scale begins with the letter D, representing colorless, and it ends with Z, which has a noticeable yellowish-brown tint. D - Completely colorless. The highest diamond color grade. Extremely rare. E-F - Colorless. Difficult to detect for anyone other than gemologists. A rare diamond. G-H - Near colorless. Extremely subtle hints of yellow noticeable only in side-by-side comparison. An excellent value. IJ - Near Colorless. Subtle hints of yellow noticeable with the unaided eye. K-M - Noticeable Color to Very Noticeable Color. Not carried by Valmand. N-Z - Noticeable Color to Very Noticeable Color. Not carried by Valmand. When talking about color, the presence of fluorescence is to be taken into consideration. Some diamonds have different fluorescence grades, meaning that a diamond has the tendency to glow when exposed to ultraviolet light. The fluorescence scale is classified from None to Strong fluorescent. 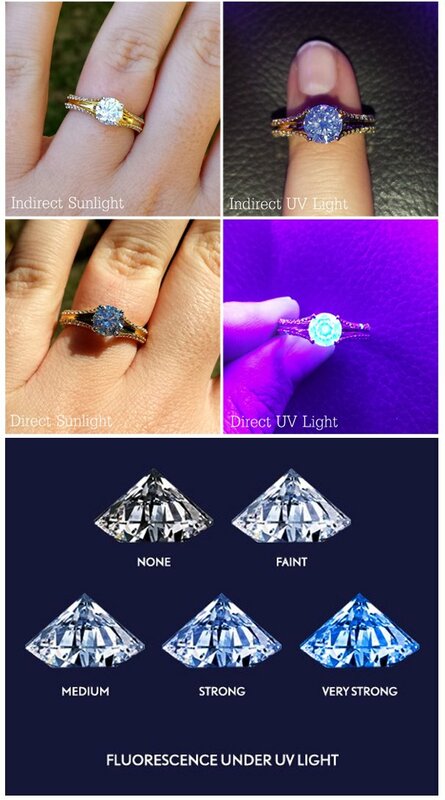 Unfortunately, some jewelers do not mention details regarding the fluorescence, misrepresenting the true color and selling diamonds with fluorescence as superior quality diamonds. Always ask for detailed information on your diamond. Clarity of a diamond is measured in the number and magnitude of the smallest imperfections found in almost all diamonds. Most imperfections are microscopic and do not affect the beauty of diamonds. Diamonds with few or no inclusions have the highest clarity on GIA’s scale. The GIA scale contains 11 grades, ranging from flawless (FL) to diamonds with visible inclusions (I3). Internally flawless diamonds (FL-IF) are very rare, more valuable and therefore expensive. Imperfect diamonds (I1, I2, I3) are less valuable and also less expensive. FL - Flawless : No surface imperfections or inclusions. The rarest of all diamonds. IF - Internally Flawless – No visible inclusions, even under magnification. Excellent diamond. VVS1, VVS2 - Very Very Slightly Included – Inclusions not visible under 10x magnification (jeweler loupe). Excellent quality. VS1, VS2 - Very Slightly Included – Barely visible under 10x magnification. Very good quality. SI1, SI2 - Slightly Included – Slight imperfections though small, visible under 10x magnification. Good value. I1, I2, I3 - Imperfect – Inclusions will be seen with the naked eye. Not carried by Valmand. The beauty of a diamond depends on how the diamond was cut. A well-cut diamond will appear very brilliant and fiery, while a poorly cut diamond can appear dark and lifeless, regardless of its color or clarity. If the diamond is cut with the proper proportions, the light returns to the top of the diamond (table). If the cut is deep, the light is lost through the sides, and if it is shallow, the light is lost through the pavilion (the bottom of the diamond) before it can be reflected. Back in 1919, Marcel Tolkowsky invented the best proportioned and faceted diamond, the "Brilliant". The gemologist distributed the 58 facets on a round cut diamond: 33 on top (including the table) and 25 facets below that reflect the ideal brilliance of the diamond. Ideal / Excellent cut – present at about 3% of diamonds. It reflects theoretically all the light entering the diamond. A special and very rare cut. Very Good Cut – present at about 15% of diamonds. It reflects approximately the same amount of light as the Ideal Cut, but at more affordable costs. Good – 25% of diamonds cut. present at about 25% of diamonds. Reflects most of the light entering the diamond, but not as much as a Very Good cut grade. Fair Cut – present at 35% of diamonds. An acceptable cut will not be as good as a good cut, but it is still part of the defining cuts of diamonds. Poor cut – diamonds are often too shallow or too deep. Most of the light escapes from the sides and bottom. The higher the symmetry grade, the more apparent the beauty of the diamond. This way, the light will reflect from a facet to another, in the same way it is trapped between two mirrors. Therefore, a more valuable diamond will have a higher symmetry GIA grade. The polish of a diamond directly affects its luster. If the polish grade of a diamondis is poor, it will affect not only its luster, but also the overall surface condition. Valmand carries only VG (Very Good) or EX (Excellent) cut, symmetry and polish rating. As Valmand diamonds are accompanied by an official diamond certificate (housecertificate or certificates issued by GIA), we guarantee the best value for a fair price. A jeweler who does not offer you a one-on-one consultation, guiding you on understanding the details of diamonds, will probably break your trust. Valmand suggest diamonds with minimum : G color and SI1 clarity, Very Good cut, Very Good polish and symmetry, without fluorescence, qualities that offer a very good quality / price ratio.